Not sure if these count as abstract, not sure where else to put them! Can you tell what it is? All will be revealed later! Cool 8), going into abstract macro now ? Hazarding a guess; is it a vinyl record with lighting positioned to reflect in the groove? Try to identify this. Straight out of camera, jpg, no cropping and only reduce in size for CF Forum. Here's one from a few year ago. Taken with 5D Mark II and EF 50mm f/1.4. Shot low to the ground, just before sundown at a beach with the surf just receding. Sea foam also dissipating. Attached is shot at about the same time. Again only reduced in size. Yes it is actually a couple of different gold records, showing signs of poor display and storage and thus having grown quite serious mould. The shots were taken for valuation purposes and for privacy I am not able to show the labels. The shots were set up with the frames flat on a table and the camera levelled directly above by zeroing a level on the table and then placing it on the rear screen and then using a geared head to bring the level back to zero, they were lit from both sides with strobes, one softbox and one reflective umbrella because I don’t have 2 soft boxes! The crops are from the lens centre out almost to the edge, I was surprised with the detail fall off, I guess that is field curvature at work! There was no intention towards artistic lighting of the grooves etc, that is just how they came out, the only reason I shared them was that I was surprised at the shapes you can see in the grooves! Very nice shot, looks like a nice location. Interesting shot, would you mind telling us what it is, my guess is wasp nest? Thanks, Graham. However, like Lion Rock's photo, it's a water shot! I was hiking along the Stony Brook in Harriman State Park in early April that year. 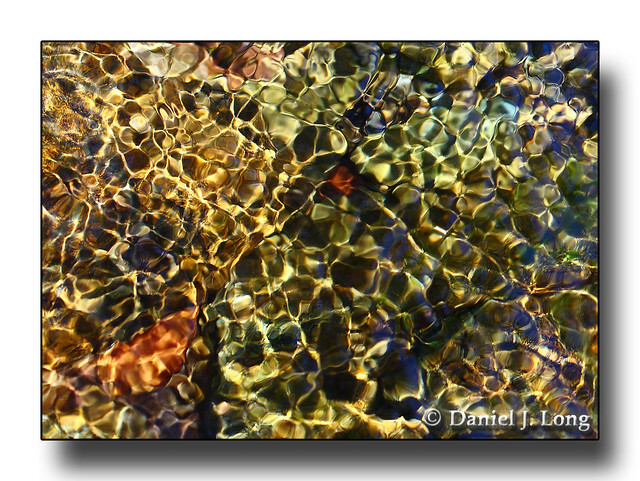 The water was clear and fairly still, but moving just enough to produce the colorful, faceted shapes. The orange shape in the lower left corner was a leaf resting on the bottom. I did notice the blotches of discolourization. Sorry about the ruined vinyl. If you have a copy of Telarc's Tchaikovsky's 1812 Overture, take a look at it. The groves at the cannon shots were very severe. Enough to vibrate the needle to skip grooves. From inside a tipi tent. EOS-R with Sigma 20mm F1.4 DG, @f1.4, ISO8000. Based on wings of a plastic butterfly garden ornament with some added texturing. Cool shot. Nicely done, GMCPhotographics.